Steven Durland and I have just published another in our series of eBooks about the most significant jobs program affecting artists in the past 70 years: CETA (Comprehensive Employment and Training Act), a federal employment program active from 1973 to 1981. This new eBook, CETA and the Arts II: Fifteen Case Studies, is a supplement to the eBook we published in October: CETA and the Arts: Analyzing the Results of a Groundbreaking Federal Job Program. 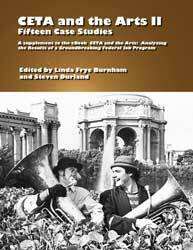 This book, CETA and the Arts II, offers details on 15 case studies that were summarized in the first book. Both of these eBooks were excerpted from a report that was prepared in 1981 for the U.S. Department of Labor (DOL) by Morgan Management Systems, Inc., Columbia, Maryland. CETA and the Arts II provides exhaustive details on 15 case studies of CETA projects conducted across the U.S. in 1978 and 1981. This supplement was designed to assist readers who have particular interest in the development and operation of specific programs and projects. Readers may access in-depth information on the project sites, including a profile of each organization involved, a review of the history of its CETA involvement, a detailed description of its CETA activities, placement results and any programming aspects that were unique to the subgrantees/contractors. To create these eBooks, we restored the text by applying optical character recognition to a PDF of a photocopy of the original study and converted it to the digital, searchable document you see here. We hope the amount of historical detail in these two eBooks will inspire arts critics and policymakers to consider the value of the CETA program and its impact on the cultural life of the U.S., especially in light of the current discussion around jobs programs for artists. Both eBooks are available from the Amazon Kindle Store for $2.99 each. Buyers do not need a Kindle device to read them; you can download a free Kindle Reader app from Amazon and read them on your computer or iPhone. We hope artists who were employed through the CETA program will visit the CETA and the Arts Facebook page and write about their experiences.